Woohooo its Friday , and I am glad it is the start of weekend . To start of the weekend right we have a cool series for you to read . I am really starting to like this author and his writing . 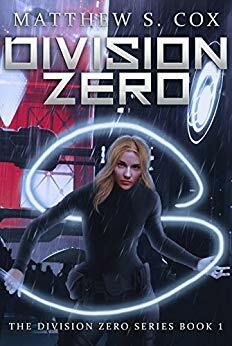 DIVISION ZERO by Matthew S Cox. Welcome to the future 2418 where being a police officer means that you are trying to keep the rampant violence down . But if you are also a police officer that is also a psionic you will be battling the ghosts . Meet Kristen Wren a young psionic and police officer . She has a talent to track and kill ghosts .. When a series of attacks puts Kristen on the case . She is now in the cross hairs for corporate assassins and a vengeful ghost . Will she survive to close the case or will she become one of the killers victims . I truly fell in love with the main character Kristen , you really feel for her . She has been through hell and back with her family . Even in the big city she feels alone and actually kind of scared. Her special powers have her chasing ghosts and she well doesn't like it . She has so many feelings and sometimes she is scared . You just want to wrap her up in a blanket and hug her tight . As you read her though she really does become a strong character and she really does come into her own . With her best friend Nicole and Dorian keep her grounded and help her figure everything out . Oh and there is something special about Dorian that kind of made me go wow .